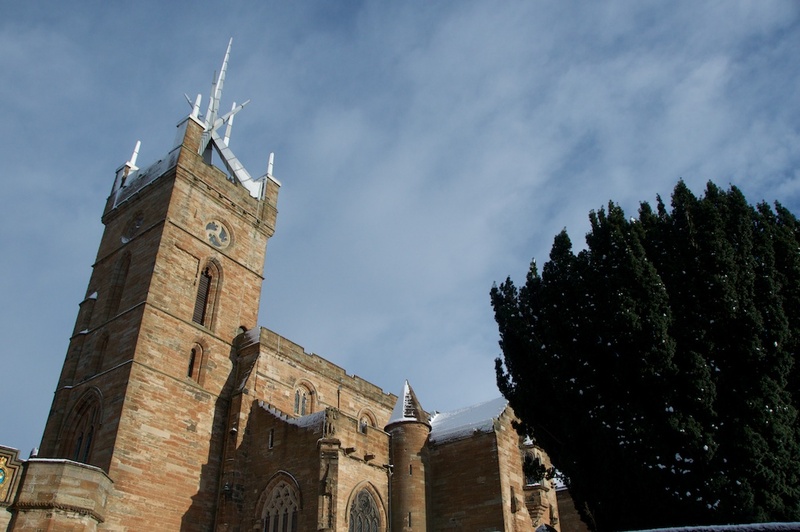 Just a few footsteps away from the spectacular main entrance of Linlithgow Palace is the lovely church of St Michael. 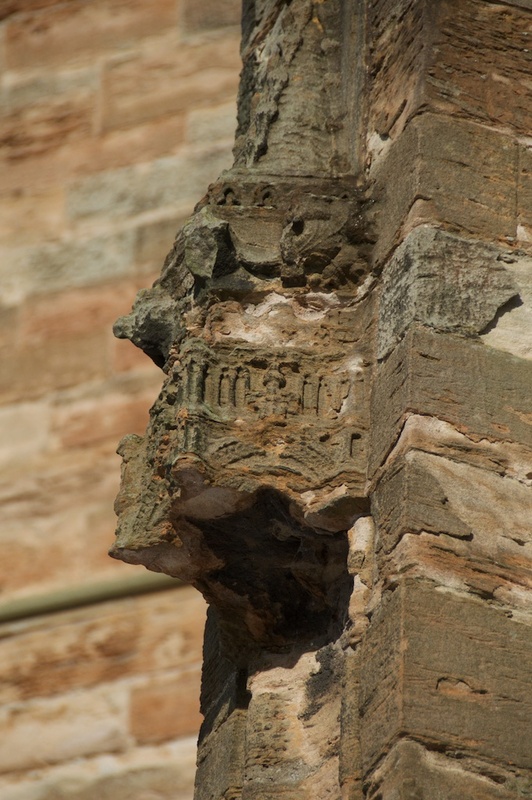 When we last visited Linlithgow Palace – which must be nearly five years ago – I overlooked the church, and I must admit that I didn’t realise what an important role it played in the history of the Palace. 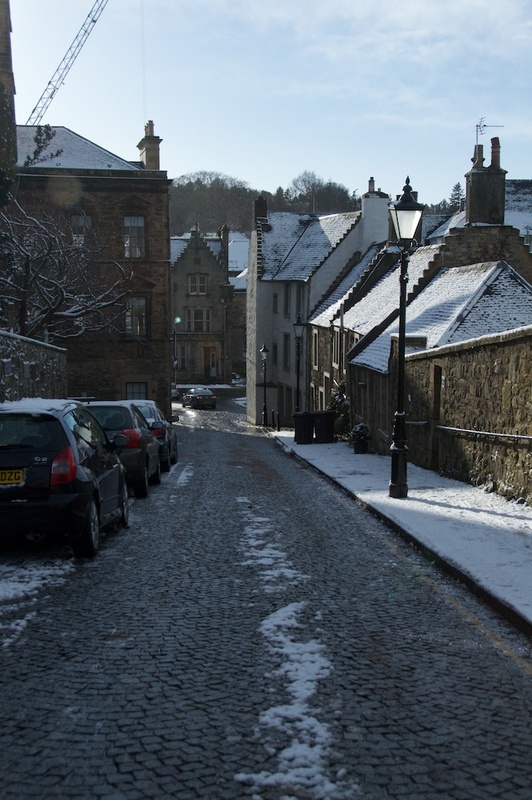 But in late January we went back to Linlithgow, and this time we took a look inside. 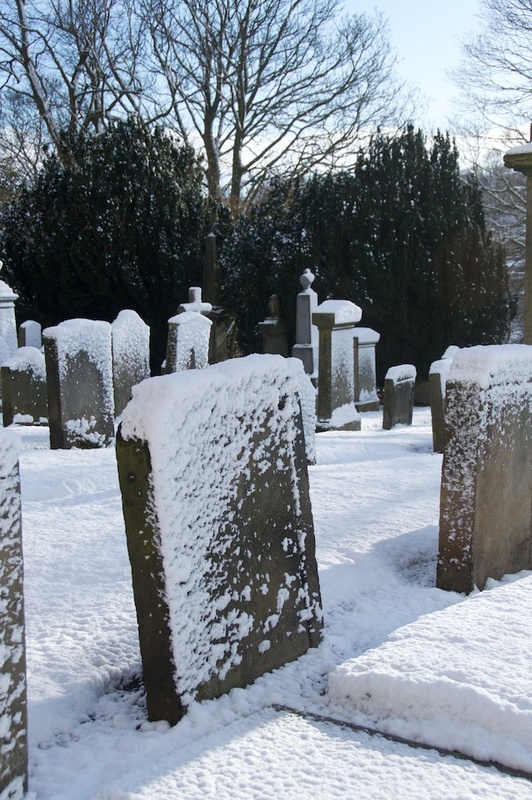 It was a bitterly cold day, and a fresh fall of powdery snow had been driven against all the gravestones in the churchyard. An organist was practising as we stepped inside, filling the entire church with an immense and magnificent sound – I don’t know what the music was but it was brilliant, and a testament to both the player and the organ itself. 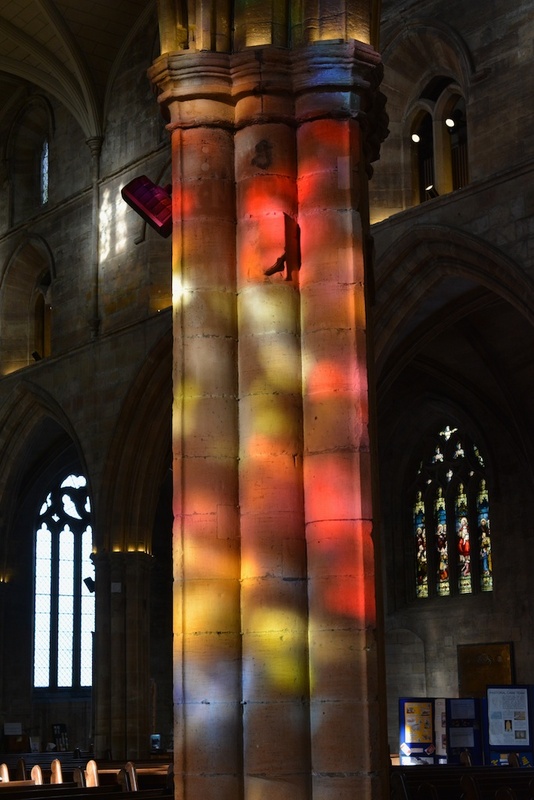 The interior was surprisingly open and light, with sunlight streaming in through the clear panes of high windows; it was also casting rainbows of colour from the stained glass onto pillars and walls, which I find endlessly fascinating and beautiful. All churches have an atmosphere, and St Michael’s is no exception, but this one was welcoming and joyful, despite the fact that some pretty scary things have happened outside its walls, and probably inside them as well. So, what did I learn about its history? The question is, where to start? 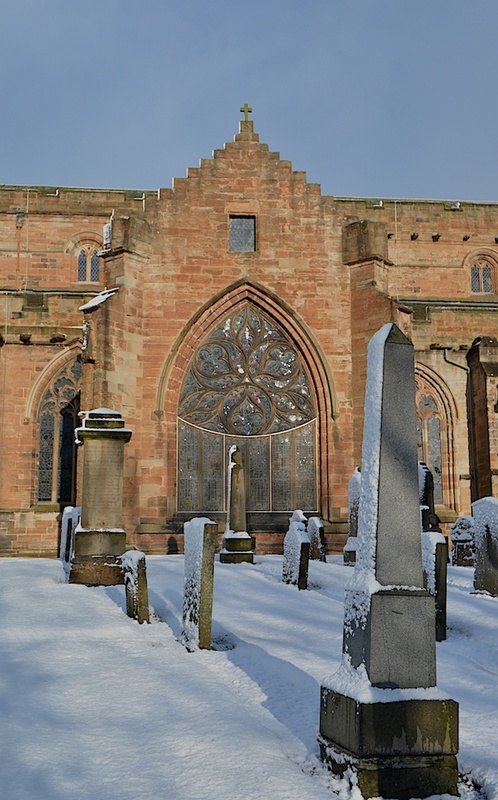 Records show that there was a church here at least as early as the 12th century, and in May 1242 it was re-consecrated by David de Burnham, the Bishop of St Andrews. Sadly, the sanctity didn’t last all that long – only about 50 years – because in 1301 the soldiers of Edward I of England used it as a store house during their rampage around Scotland. 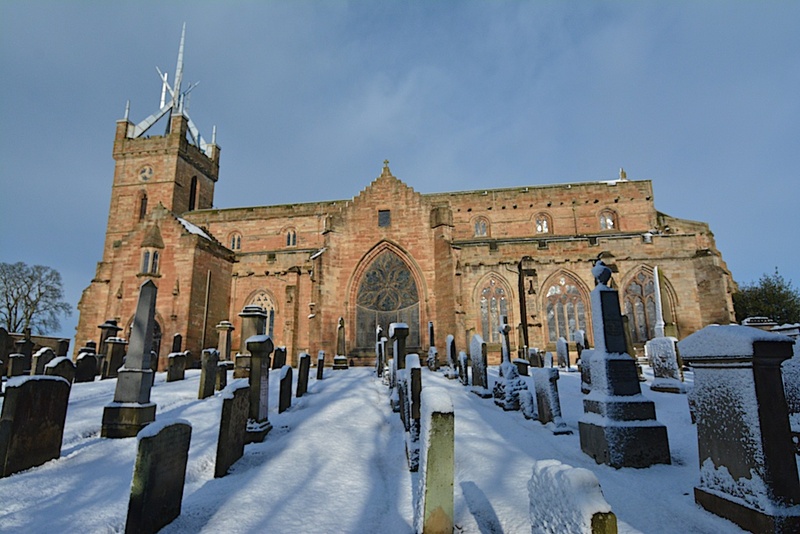 After the Battle of Bannockburn in 1314, the church was reported as being in dire need of repair; and if it was carried out, it needed re-doing in 1337, after another English attack on Linlithgow. The time the town, whose houses were built mainly of wood, was reduced to a smouldering heap of ashes. 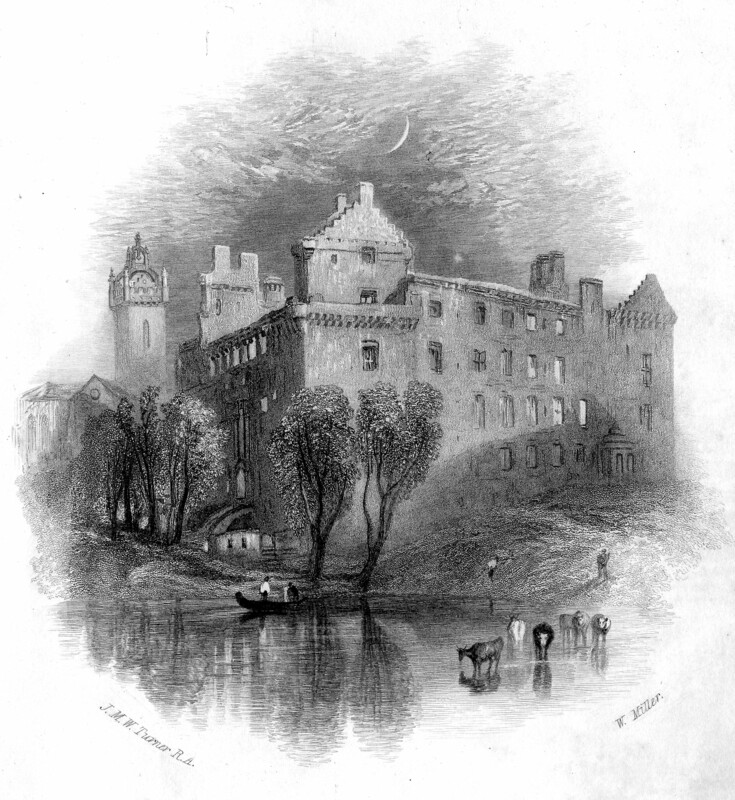 But the 15th century brought a new lease of life to Linlithgow, with the return of James I from exile in England. In 1425 he set to work on building a new Palace, and this became a favourite retreat – you could call it almost a holiday home – of the Stewart kings. It was surrounded by a lovely park, and there were plenty of opportunities for the gentlemen and ladies of the court to go hunting. 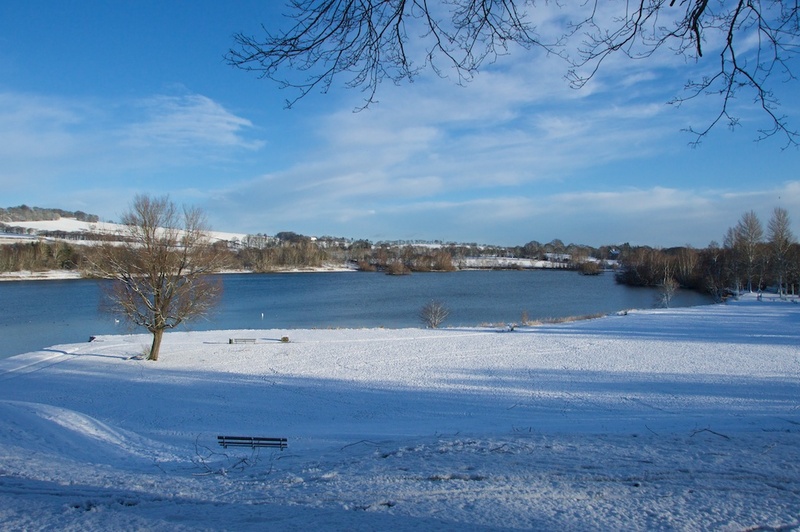 The park around Linlithgow Palace is also known as the ‘peel’ or ‘pele’, which refers to the protective wooden palisade thrown up by Edward I around the grounds of his timber castle. Incidentally, it is a variant of this word which is used in the phrase ‘beyond the pale’, meaning to overstep a boundary. A new church soon started to rise up alongside the Palace, and in 1513, although it was still only partly completed, James IV stepped inside to pray. While he was deep in prayer he is reported to have been visited by a ‘strange spirit’, who advised him not to go to war against the English; but James, who seems to have had a restless and strangely haunted nature, decided that he would feel the fear and do it anyway. He should have listened. He died that same year at the Battle of Flodden, while his wife, Margaret Tudor, stood anxiously at the topmost turret of the Palace and watched for his return. James’ son, James V, appears to have had a similar love affair with doom. 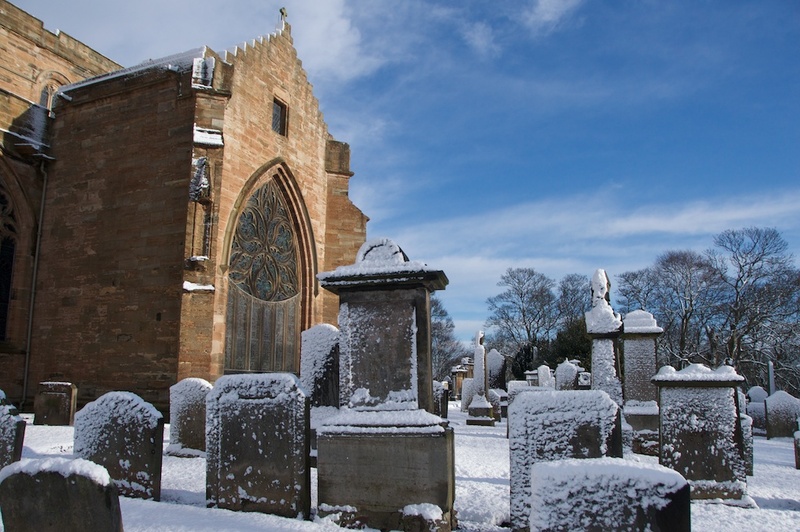 In 1542, after his defeat at Solway Moss, he sank under a weight of grief or depression (some historians suspect it was cholera) and died in nearby Falkland Palace, while his queen, Marie of Guise, gave birth to a daughter in Linlithgow. This was Mary Queen of Scots, and she was baptised in St Michael’s Church. The mid-16th century was not a happy time for churches in general and St Michael’s in particular. In 1559 all the beautiful sculptures of saints which adorned the outside of the building were smashed by zealous Reformers. Then they turned their attention to the interior, destroying all the beautiful religious ornaments and stained glass windows. Why? It’s a long story, but it stems from a rebellion by Protestant clergymen against the Roman Catholic Church, a movement which had spread throughout Europe. The leader of the Protestant Reformation in Scotland was John Knox. A firebrand of a preacher, Knox was a clever but dangerous man, capable of rousing a peaceful congregation and turning them into a violent rabble. Eighty years later another storm was brewing, and this one was just as destructive. 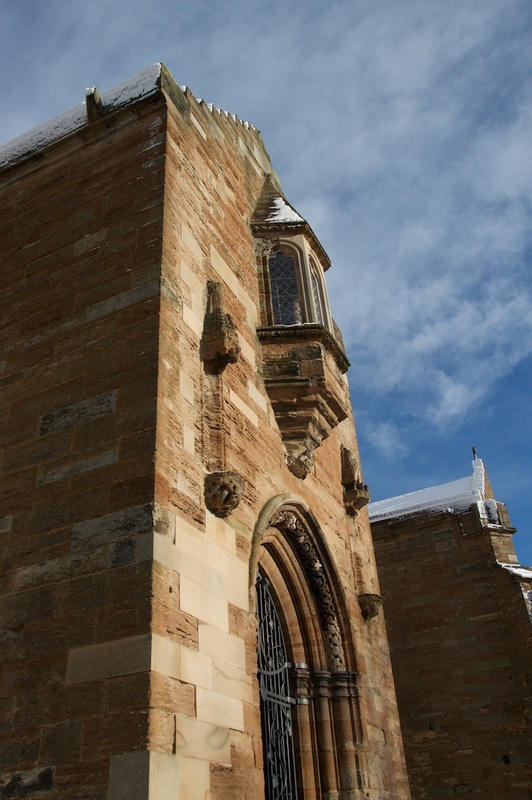 In 1638 one of Scotland’s National Covenants, expressing people’s outrage at the attempt by Charles I to impose his authority on the Church of Scotland, was signed in St Michael’s Church. Both in Scotland and south of the border in England, the seeds of Civil War were being sown, and in 1649 the King paid with his life. 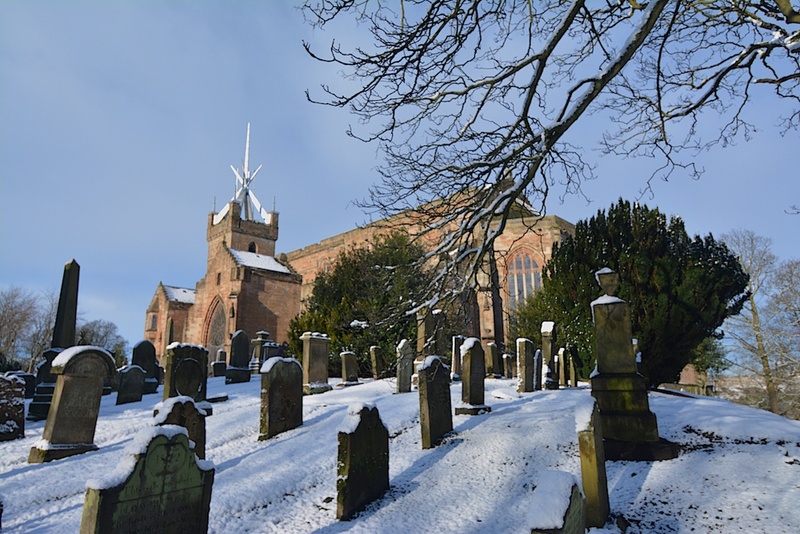 The next year, in September 1650, Cromwell’s troops defeated the Scots at Dunbar and made their way to Linlithgow where they turned the Palace into a barracks and stabled their horses in the church. The Scots weren’t giving in that easily, however, and over the following months they mounted a series of raids on the garrison. On 11th January 1651, under cover of a winter storm, around 2,000 Scotsmen went on the rampage, but neither this nor any successive attacks had the desired effect. The English soldiers finally left of their own accord in July 1651. 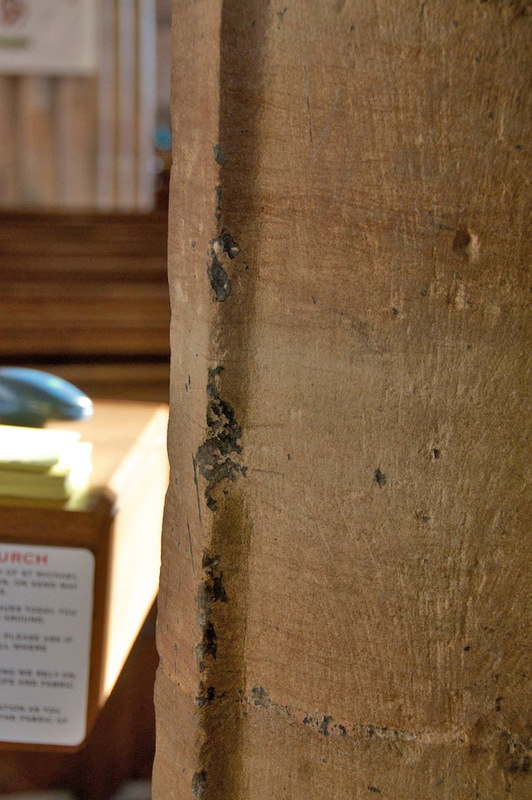 These grooves in the wall of the nave are where Cromwell’s soldiers apparently sharpened their swords; and there are three holes in the wall which bear witness to some musket practice. 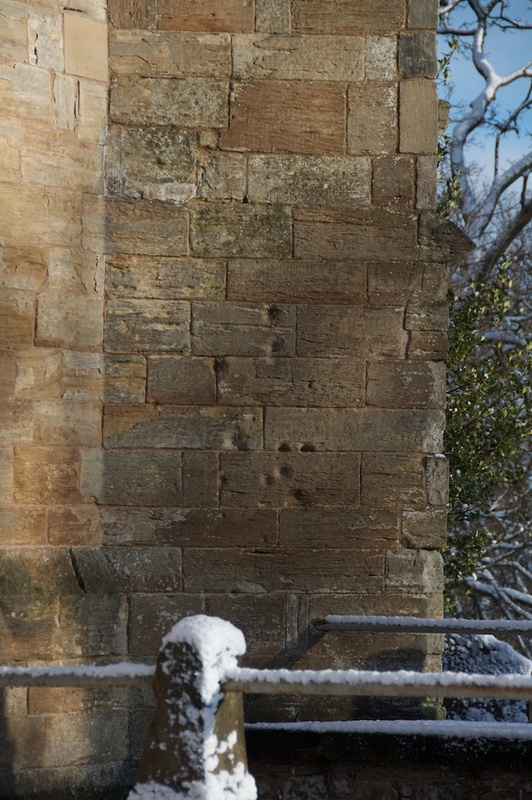 Outside, parts of the wall are peppered with shot. These are so concentrated, and they are at such a particular height, that I have got to say I suspect they are the marks of a firing squad. In the 18th century, according to the Church’s website, things got pretty strict. Drunkenness or adultery were frowned on, as you might expect, but so was any disrespect of the Lord’s Day such as working or washing your clothes or even whistling. The church was furnished with a repentance stool, on which an offending person had to sit during service and endure the silent criticism (or pity) of the congregation. Any breaches of church discipline resulted in a fine. The website adds that a sand-glass was attached to the pulpit, timing the vicar’s sermon to ensure that he spoke for at least two hours. Singing was unaccompanied, because presumably any instrumental music in the church was thought of as blasphemy. They must have been scared even to smile. In 1812 the medieval timber roof, which had been rotting away quietly over the centuries, was replaced with a plaster one (above), made to look like stone. 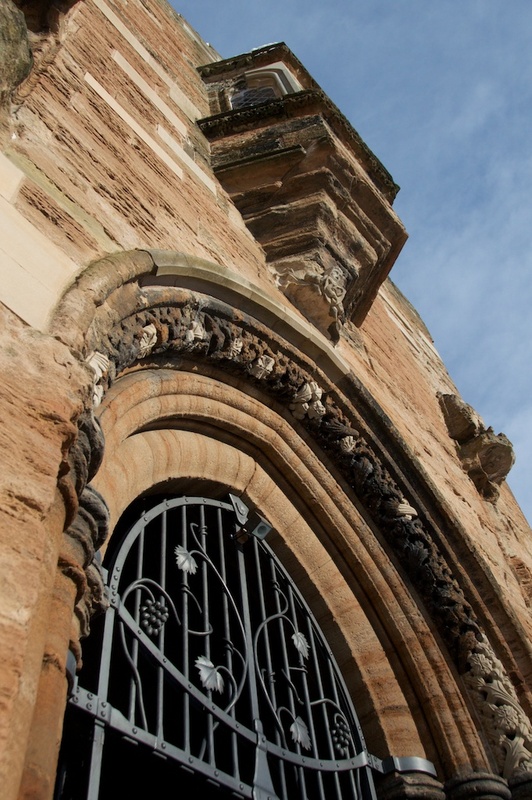 A spot of ‘re-modelling’ went on in the interior, which included the removal of an old dividing arch between chancel and nave – much regretted in later years – while at night watchmen had to patrol the graveyard, to prevent grave-robbers from exhuming recently interred bodies and carrying them off for sale to anatomy lecturers in Edinburgh. 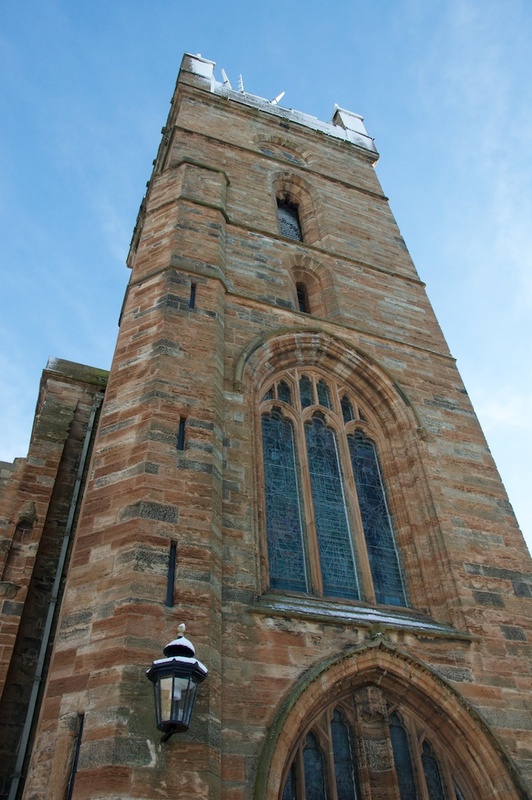 In 1821 the 400-year-old stone steeple, shaped like a crown to reflect the church’s royal connection, was discovered to be in danger of collapse and had to be dismantled. The tower remained bare of headgear until 1964, when a new lightweight spiky crown of anodised aluminium was designed by Geoffrey Clarke. There are few images of the church with its old ‘crown’ still intact, but I found this one (above), an engraving by William Miller after J M W Turner. In 1992, to celebrate the 750th anniversary of the church, a magnificent new stained glass window was added in St Katherine’s Aisle. 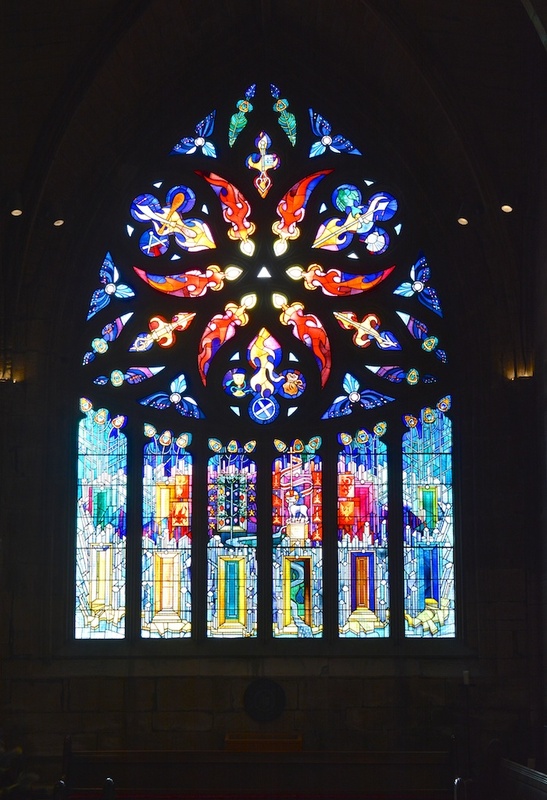 It was designed by Crear McCartney to represent the Pentecost, and it must be one of the most beautiful windows I’ve seen. An entrance in the north side of the church, which offered convenient access for royals staying in the Palace, has now been sealed off. However, according to some witnesses it appears that it is still in use. Early one morning in 1973 a custodian of the Palace, together with a group of visitors, reported seeing a ‘blue lady’ floating over towards the church, accompanied by the rustle of silk skirts. She appeared to vanish a few feet in front of the wall. This apparition has been sighted again, most often in April around nine in the morning, but also in September. St Michael’s Church has an ongoing programme of worship, and I was interested to see on their website that full details are given of the history and workings of the magnificent organ. There are two services every Sunday and a prayer meeting is held on Wednesdays at 12.30. It sounds as if the community is just as welcoming as the church itself, bearing out its old motto “St Michael’s is kind to strangers”. With its long history of rough treatment, it is heartening that such a lovely atmosphere remains. Take a look at my earlier features on Linlithgow Palace and the amazing fountain in the courtyard which once ran red with wine! Such an interesting place and beautiful photographs. 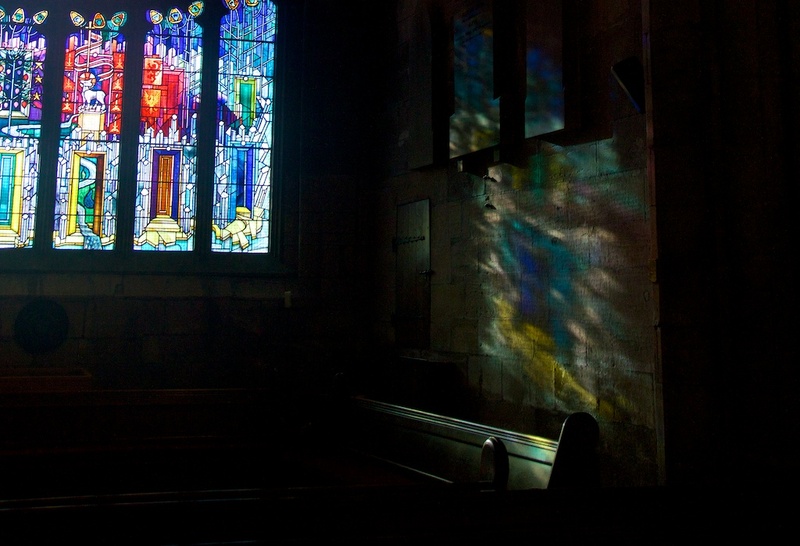 I loved the stained glass rainbows. I know, Jessica, I loved it too! Yes, those windows are lovely and there was a nice mix of plain and stained glass. Very interesting post Jo. I think the stained glass window is magnificent. I’m glad I wasn’t around when the sermons would last two hours! Thanks, David! I know – imagine having to listen to a two-hour sermon, and not fidget or fall asleep, because presumably you’d end up on the repentance stool! 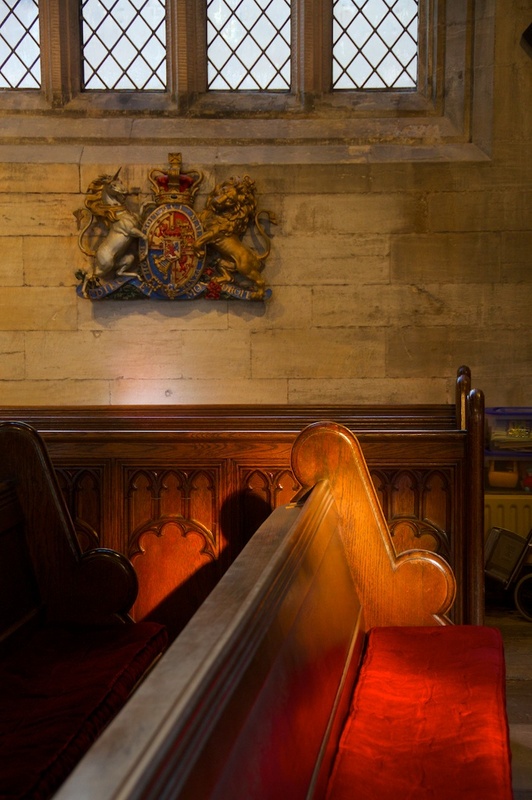 A beautiful selection of photographs, Jo, I especially like the one of the red-tinted light on the pew. So many of these magnificent buildings have terrible tales to relate but it’s wonderful that they’re still standing and holding all these stories. It’s something special when you enter an old church and someone’s playing the organ, I can imagine how that must have enhanced your visit.